“We will beat their a– in Game 4,” Gerald Green told Slam Online, long recognized as the asphalt’s hip-hop scripture. Green has been around the NBA since 2005, a prehistoric time when hooligans were hooligans and 6-foot-10 players referred to as “Stretch 4s” were deemed too soft to play inside. This was the pre-Stephen Curry era, when teams actually hit the boards rather than caressing them. But there we were in Game 3 of the Eastern Conference semifinals, in the middle of the league’s most ornery playoff series. Thomas spoke with a temporary bridge to conceal the tooth knocked out in Game 1 in Boston, a bridge he had to have adjusted before the third quarter last night. He spoke after Kelly Olynyk, his strapping, carefree teammate, set two nasty picks on the Wizards’ Kelly Oubre Jr., a normally baby-faced, polite youngster who went cuckoo for Cocoa Puffs after the second pick. Seeing red, Oubre popped up from the floor and Brahma-charged Olynyk, pushing him to the floor and doing everything but throwing a punch. 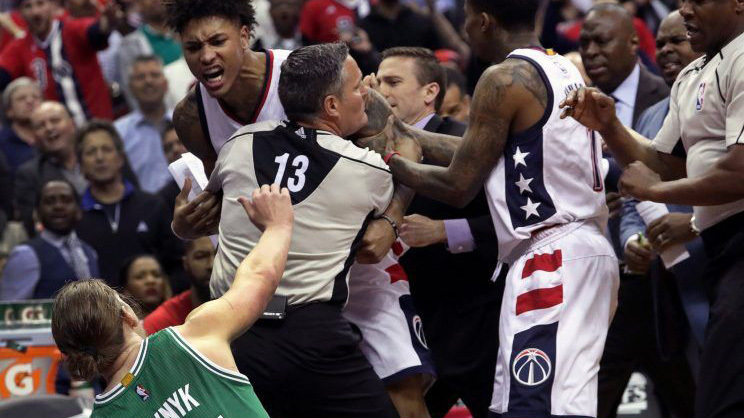 Washington Wizards forward Kelly Oubre was ejected for a vicious shove to the chest of Boston Celtics center Kelly Olynyk in the second quarter of Game 3 between the two teams. This sort of thing has largely been unseen in the NBA since Auburn Hills, Michigan, circa 2004 — the Malice at the Palace, an infamous brawl between the Pacers and Pistons and players vs. fans. And it involved two usually docile souls. As Thomas said of Olynyk, “No offense against Kelly, but he’s not that type of guy.” Well, OK. Kevin Love and Cleveland might disagree. Still, it reminded me of the time bodies were pulled from a pile of brawling NBA players in Miami 20 years ago this May. At the bottom were P.J. Brown, the congenial Miami Heat forward and winner of the league’s citizenship award that year, and Charlie Ward, the library-quiet Knicks point guard who brought two things to every game: himself and his Bible. The NBA playoffs used to transform the nicest souls from heavenly to hellish in a heartbeat. And although Game 3 Thursday night was not exactly Knicks-Heat circa the late ’90s, or the Bad Boys hip-checking Michael Jordan or Larry Bird into a stanchion, it’s the closest thing anyone can remember in these kinder, gentler times. When I communicated the Wizards’ tough-guy sentiments to some of the Celtics late Thursday, I got a couple of death stares — and pleas for the next officiating crew to lower the testosterone level of the series. Or else. “Everybody’s got to be allowed to play physical,” Celtics guard Marcus Smart said through a mumble as he sat at his cubicle. “You can’t just let one team play physical. 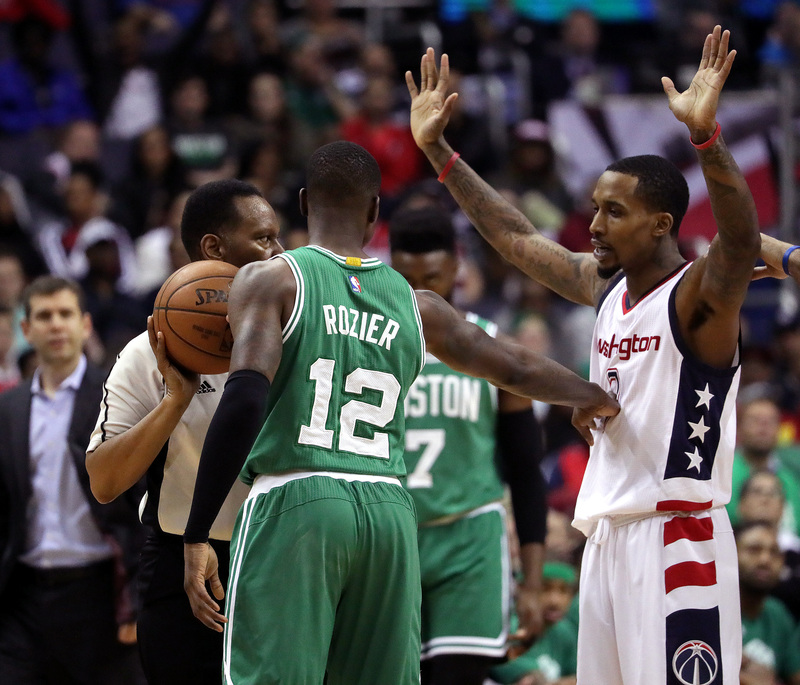 Boston Celtics guard Terry Rozier (12) and Washington Wizards guard Brandon Jennings (7) get into a shoving match during the fourth quarter. The Washington Wizards host the Boston Celtics in Game Three of the NBA Eastern Conference Semifinals at the Verizon Center in Washington, D.C. on May 4, 2017. We’re going to have to take it upon ourselves to clean it up. Van Gundy is, of course, a respected ESPN NBA analyst. But before then, he coached the Knicks in several Steel Cage Death Matches against Pat Riley’s Heat, a rivalry that produced several of the ugliest offensive eyesores in the game’s modern history — and also one of the greatest rivalries the league has known. 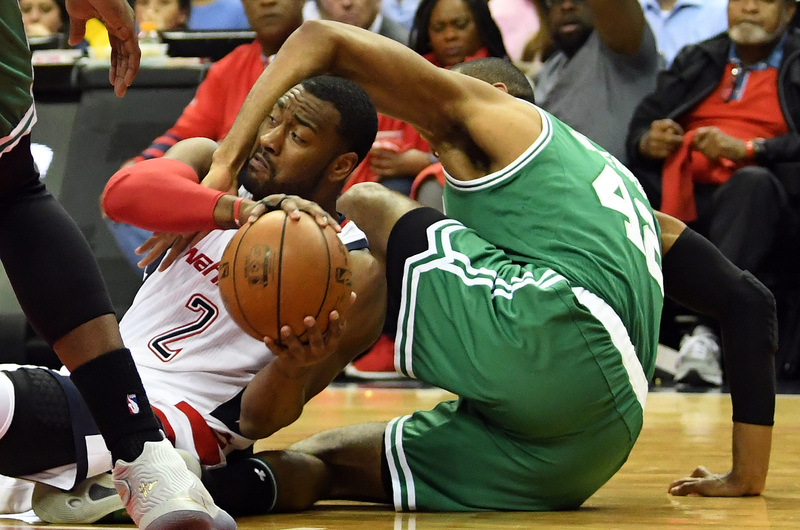 Maybe that’s why Wizards-Celtics feels so compelling amid the chaos. Yes, it features Boston’s Thomas, the most scintillating little man to carry a team since Allen Iverson in 2001. His dynamic play qualifies as even more amazing given the impossibly heavy heart he carries having lost his sister in a car accident three weeks ago. And it features the coming-out party of Washington’s John Wall, whom former player Caron Butler simply calls “the second-best player in the Eastern Conference” behind LeBron James. John Wall #2 of the Washington Wizards battles for the ball with Al Horford #42 of the Boston Celtics in Game Three of the Eastern Conference Semifinals at Verizon Center on May 4, 2017 in Washington, DC. But in a sharp rebuke to a generation of players who first declared themselves open from 30 feet and beyond on their mothers’ sonograms, this series is as much about brute force as beautifully patterned offense. Boston’s Smart and Jae Crowder have the physique and aggressiveness of two bruisers who could have been plucked in the first round — of the NFL draft. With so many friendships among opposing players in the league today, Wizards-Celtics is almost refreshing. Wall and Thomas have great respect for each other. But aside from those two, the chances of finding the Celtics and Wizards hanging at the Rocket Bar or Penn Social after the game Sunday night is very slim. Check it. One time. Or something like that.